A few months ago everything changed; like millions of others I stumbled on Eljolto's Important Videos playlist and became trapped in its orbit. Since then it has spread over the internet, enlivening the lives of all and sundry, to the extent of being mentioned on the BBC. Important Videos is no longer our special secret. Now it is the world's special secret. "This is the time, and this is the record of the time"
It's a masterpiece of comedy that could only exist and spread in the modern age. Back in 1975 sci-fi visionary John Brunner published The Shockwave Rider, an early classic of what would become the cyberpunk genre. As a work of fiction it has none of William Gibson's pizzazz, but as prophecy it remains startling. The dumb terminals and wired telephones are outdated, the notion of Future Shock remains debatable, but the cloud-based internet, zero-hours contracts, even Wikileaks are all recognisably modern. One concept that seems strange nowadays is the Hearing Aid, an electronic telephone line that can only receive calls. In Brunner's book it is an electronic confessional booth; the last and only refuge of fugitive thoughts. Unlike the booths in THX 1138 is is genuinely anonymous. "Only I heard that", it says. Back in 1998 Brunner's concept - also called "the Ten Nines", after its telephone number - inspired a chap called Wally Glenn to start up his own, internet-based Hearing Aid, which sadly doesn't work any more. Alongside this Glenn also set up an "open Web diary", which would nowadays be called a Blog. The social aspects of the World Wide Web have always been driven by two conflicting desires. Firstly the desire to connect with and be respected by others, to become the big shot we wish we could be; secondly the desire to be anonymous, or to have a distinct internet persona, in order to shield oneself from bad things. Journalists and pop cultural figures from the mainstream media generally do not have the luxury of anonymity, which is one thing that separates traditional from new media. Doxxing, or de-anonymising internet stars, is one of the most powerful weapons that traditional media has against the snowflakes of the internet. Eljolto himself was unmasked by the BBC as a young man called Eddie Jolton, but unlike internet trolls and naysayers he has nothing to be frightened of, because he has righteousness on his side. Important Videos is a force for good, and a man - or woman, although Eddie is a man, but he could have been a woman - a man who could create such a thing cannot be all bad. Two men dressed in British colonial desert gear stand beside a dock. The first man does a little dance which culminates in him slapping the second man across the face with a small fish. We expect the second man to do the same, but instead he pulls out a much larger fish and wallops the first man, knocking him into the water. There is no dialogue and we have never seen the characters before, but it is funny because the punchline was unexpected. "Yee" is a masterpiece of minimalist cinema. The three shots set up a scene, deliver a punchline, and show us a reaction. It has the structure of a classic pratfall. We have no idea who these dinosaurs or, or what history has transpired between them, but in the space of just ten seconds the clip introduces us to a new world and new characters, sketches out their relationship, and tells a short story. It is a work of genius. On a narrative level there is an ambiguity. 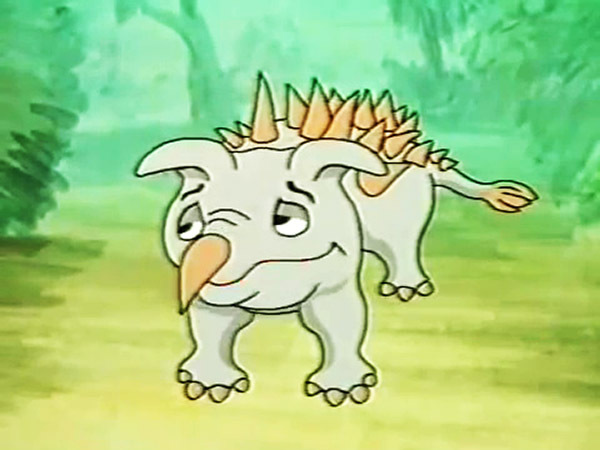 Is the quadruped unfairly put-upon, or is the second dinosaur's irritation reasonable? What little we learn of the pair suggests a relationship akin to that of Sesame Street's Bert and Ernie, in which Bert is a happy sort who occasionally and unfairly needles his friend Bert, while Bert is prone to bouts of anger but is, on a fundamental level, a good man who just wants to be left alone. Critical analysis of the relationship between Bert and Ernie tends to focus on their suggested homosexuality, but in my opinion their portrayal of passive-aggressive codependency is at least as fascinating. It's notable that the supposedly cold, stand-offish Bert is the only one who expresses genuine love - but his love is for pigeons rather than other human beings. Is Bert a human being? Are pigeons sentient in the world of Sesame Street? I don't know. Beyond its merits as pure comedy "Yee" is also a masterpiece of cinema. It is often said that the thing that sets cinema apart from other art forms is not so much the technology of photographic motion, it is editing. Editing allows the filmmaker to subvert the linear flow of time and also to create new adjacencies from unexpected juxtapositions in a way not possible with other art forms. 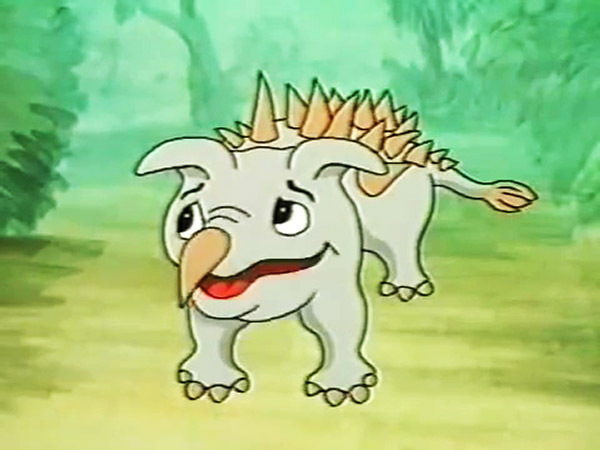 "Yee" is a creation of the editing room. The shots of the dinosaurs are taken out of sequence; the crestfallen look on the face of the first dinosaur occurs in the original film before the second dinosaur interrupts, and is in reality just a resting face. It is a classic example of the Kuleshov effect in action, whereby a shot's meaning is altered by juxtaposing it with new surroundings. The happy song itself is invented. In the original film the dinosaurs did not sing. They were instead engaged in conversation. 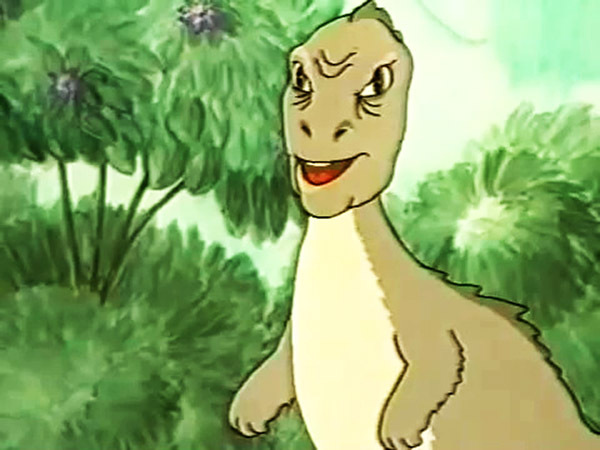 The song was created by digitally editing fragments of their speech, and given the poor quality of the original animation there is a case to be made that the ten seconds of "Yee" had more work put into them than the entire rest of the film. Those ten seconds will live forever. Off to the cinema to see Rogue One, a new film from the mind of Hollywood wunderkind George Lucas. Eighteen months ago Lucas was a nobody, at least outside the United States, where American Graffiti was a smash hit. Now he is the saviour of cinema, and all because of one film. A charming space fantasy adventure that takes place in "another galaxy, another time". Conventional wisdom had it that the top flicks of 1977 would be Airport '77, The Other Side of Midnight, and perhaps Sorcerer. Instead they failed to entice crowds, and it was up to George Lucas - and close friend Steven Spielberg, with some help from our very own James Bond - to give Hollywood something to be cheerful about. Few films have given Hollywood more cheer than Star Wars. Two years later it is still a phenomenon. Toys based on the film's characters were the must-have Christmas presents last year and the soundtrack album remains a best-seller. George Lucas has talked about an epic "trilogy of trilogies", with Star Wars as episode four in a nine-film saga. He is currently working on episode five, and time will tell whether his ambition will get the best of him. Star Wars told a complete story but the characters were engaging and the simple good-vs-evil plot was a breath of fresh air in these cynical times. On the surface it was a simple film - but it was also a bold experiment in post-modern cinema, a homage to the Flash Gordon serials of yore; a clever exercise in constructing a modern mythology out of plywood and plastic. Rogue One is an experiment too, but of a different kind. Instead of continuing the adventures of Luke Skywalker and pals, Rogue One is instead "a Star Wars story", a prequel that exists outside the series' nine-film arc. Lucas claims that this gives him the creative freedom to tell stories that would not fit in the series otherwise. Personal stories, with a mature tone. With its "A" certificate Rogue One is noticeably grittier than its parent, although it's hardly A Clockwork Orange. If Star Wars was a compendium of fantasy clichés, Rogue One takes its cues from war classics such as The Guns of Navarone and Westerns such as The Good, The Bad, and The Ugly (or in this case The Neutral, the Evil, and the Droid). A less charitable reviewer might point out that Rogue One is a quick cash-in designed to give 20th Century Fox another sip at the well, especially given Lucas' decision to self-fund his next adventure; but who am I? With Lucas busy elsewhere Rogue One is directed by Briton Ridley Scott, more famous for his television commercials than The Duellists, his sole theatrical film. With that film Scott demonstrated that he could imitate Stanley Kubrick as well as anyone, which is presumably why Lucas gave him the nod. For Rogue One Scott has toned down his cinematic mimicry. His direction has none of Lucas' artistic flair, but he does a tremendous job at making the Star Wars universe seem real, especially given the film's reportedly modest budget. Each shot is lit with a wash of colour - blues and oranges predominate - and if the characters spend too much time running down corridors, they are at least visually interesting corridors. Despite the fact that there are no cigarettes in the distant universe of the Jedi, the sets are usually bathed in smoke, which if nothing else disguises the gaffer tape. The producers have also shaved costs by filming the desert scenes in Spain, doubling for the planet Jakku, rather than Tunisia. The effects of evil villain Darth Vader's moon-sized superlaser are stock footage from the original, and although there is one exciting albeit brief space battle, for the most part the action is earth-bound - or "planet-bound", because this is set in space after all. Gone too are the original film's distinctive light swords, and almost all of the hippy mysticism surrounding The Force, as Lucas called it. The Force was embarrassingly twee, but I miss it; Rogue One suffers from a lack of magic. Ridley Scott has talked of his distaste for supernatural deus ex machina, but Rogue One feels small, dare I say anonymous without Lucas' muddled spiritualism. But what's it like? The film follows a band of heroic spies, who are sent on a desperate mission to capture the blueprints of the aforementioned Death Star. Peter Cushing returns as the villainous Moff Tarkin, although with Darth Vader presumably busy elsewhere the chief baddie is this time Designer Krennic, played with gusto by Oliver Reed, who by all accounts enjoyed himself immensely during filming, to the extent of joining the production in Spain, even though he does not appear in that section of the movie. Beyond Cushing, only Carrie Fisher returns from the original cast, in a sequence that cleverly matches the very beginning of Star Wars. I'm not sure if the little man inside R2D2 returns, or if they simply moved the prop around the sets with invisible strings. What of our heroes? Much has been made of screenwriter Alan Dean Foster's unisex names; Scott likened the casting process to "throwing darts at a Ouija board", albeit that yet again the board appeared to be whites-only. The decision to give the film a female star - in a gritty war picture, no less - has been met with incredulity, but newcomer Debra Winger is convincingly weather-worn as wayward spitfire Jyn Erso. Only one year older than Star Wars' Carrie Fisher, she carries much of the film's emotional backbone, although perhaps inevitably she is nonetheless captured by a mini-villain (played by Omar Sharif, almost unrecognisable in a gas mask), and has to be rescued. Of her merry band of brothers Harry Dean Stanton stands out as an Imperial pilot who has been artificially aged under torture, while a bearded Tom Skerritt plays ruthless agent Cassian Andor, who develops a platonic respect for the supposedly inexperienced Jyn. And I stress platonic; in one amusing scene the film acknowledges the obvious age difference between them. Of the rest of the cast Ian Holm has a neat turn as reprogrammed Imperial robot K2SO. It's curious that the clunky "mechanicals" in Star Wars are less advanced than Holm's convincingly humanoid robot - presumably another cost-saving measure - but his world-weary performance won me over. By now John Williams' score is almost a character by itself, but beyond a new theme for Tarkin and some desert music it is noticeably more spartan than the original (the famous Star Wars theme does not appear until the end). Will children like it? The new cast are older the originals, and although the action sequences are plentiful they tend to follow the same basic formula. Our heroes journey to a local warlord, but are interrupted by Imperial stormtroopers and escape in the nick of time; our heroes attempt to rescue a key characters' father, but are thwarted in the nick of time; our heroes attack an Imperial installation, and actually do manage to achieve their goal - but to say any more would spoil the ending. Despite a first half that takes place in the desert Rogue One lacks the weather-worn aesthetic of the original, and of course the ending owes a lot to Butch Cassidy and the Sundance Kid. Parents will have to explain to their children that sometimes victory has a high price. It will be interesting to see if the toys are as popular, given that fate of almost all of the characters. Nonetheless, as both an experiment and a solid action film, Rogue One is a success. It convincingly demonstrates that the Star Wars universe can carry a film by itself. Of course it has strong immediate competition from Moonraker, which cost much more and has a lengthier space battle, but doesn't look any more expensive, and there is the looming threat of Paramount's Star Trek: The Motion Picture and Disney's The Black Hole, both scheduled for release later in the year. Will they spoil the public's appetite for Star Wars V?